Linda Lou Creates: I'm Going on a Trip!! Early tomorrow morning I leave for a Stampin' Up convention in Hartford, CT. I can't wait, it will be my first one!! I'll be meeting lots of people, and especially can't wait to meet fellow members of our SU group AND our upline!!! 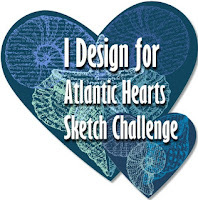 I had one last card to create before leaving, and it's for the Atlantic Hearts Sketch Challenge.